Impounded vehicles will only be released to the registered owner unless prior permission to a second party was authorized by the owner and a Second Party Vehicle Release Authorization form has been completed and notarized. The Second Party Vehicle Release Authorization form can be downloaded here. For all impounded vehicle releases proof of valid insurance, valid registration, and a valid driver’s license is required. 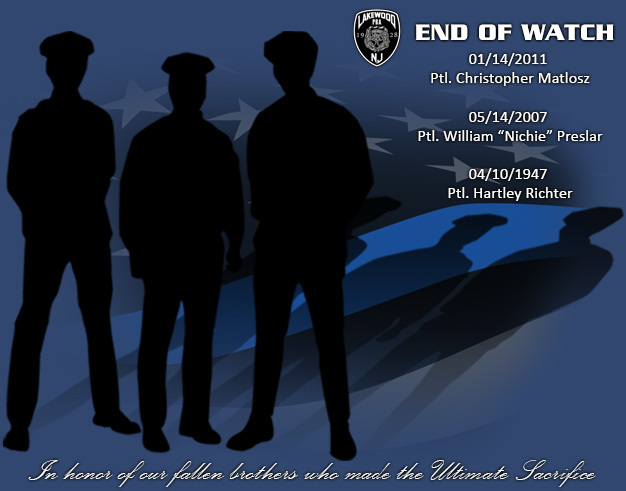 Requests for a report may be mailed to the Lakewood Police Department, PO Box 540, Lakewood, NJ 08701. Please include a copy of a valid picture ID and phone number. 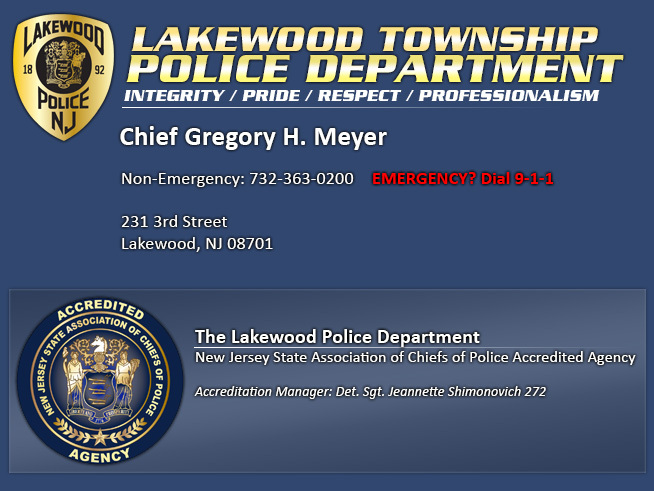 Police Reports may be picked up in person at the Lakewood Police Department, 231 3rd Street, Lakewood, NJ 08701 from 9:30 am to 4:45 pm. Letters of Good Conduct are no longer provided by the Lakewood Police Department. If you need a “Good Conduct Letter” you must follow the procedures outlined at the New Jersey State Police website at www.njsp.org and look for the appropriate forms concerning “Good Conduct”. When applications are turned in, you will receive instructions to have your background check done online. Enter NJ1051400 in the ORI Number Field. Upon completion of the form, you will receive an email confirmation and receipt that will include a confirmation number. At this time the request will be forwarded to the Police Department’s work queue for approval and submission to the NJ State Police for processing. You can find more detailed information by clicking the HELP TAB, located on the top right side of the page. After you complete your background check online please make a copy and submit it to the Central Records Division at the Lakewood Police Department with your application. If you already have a firearms ID card a background check has to be done every time you submit an application.